ANSELM, a nobleman and brother-in-law of Aistulf, King of Lombards (r. 749–756). St. Anselm was a career soldier before he left the world and received monastic tonsure. He was the founder of abbeys in Fanano and Nonantola, near Modena in the Po Valley. Both monasteries had hospitals and hostels attached to them. St. Anselm served as Abbot of Nonantola, which grew to around one thousand monks. He reposed in 803. ARTHELAIS, one of the patron-saints (along with SS. Barbatus 19th February, and Bartholomew the Apostle 11th June) of Benevento in Italy. St. Arthelais was the daughter of an imperial proconsul named Lucius and his wife Aithuesa and is said to have been pursued by Emperor Justinian I (r. 527–565). However, she had taken vows of chastity and fled to Benevento to escape the Emperor’s attentions. St. Arthelais reposed of a fever in 560. CALUPAN, an anchorite who lived in a cave near Méallet in Auvergne. He reposed in 575. CAMILLA, after being converted to Christianity by St. Germanus of Auxerre (31st July), St. Camilla became one of his disciples, finishing her life as an anchoress, reposing circa 437. CELE-CHRIST, St. Cele-Christ (Worshipper of Christ) led an hermetic life for many years, before being forced to accept a bishopric in Leinster. According to The Annals of Ulster , he reposed 728. There is no further information on his life extant. CUNEGUND, the wife of Emperor Henry II (r. 973–1024) and foundress of Kaufungen Abbey, near present-day Kassel Germany. following repose of Henry, St. Cunegund received monastic tonsure at Kaufungen where she spent the remaining fifteen years of her life, reposing in 1039. EMETERIUS (HEMITERIUS) and CHELEDONIUS, (Fourth Century), two soldiers in the Imperial Roman army who were martyred in Calahorra in Old Castile, present-day Spain. 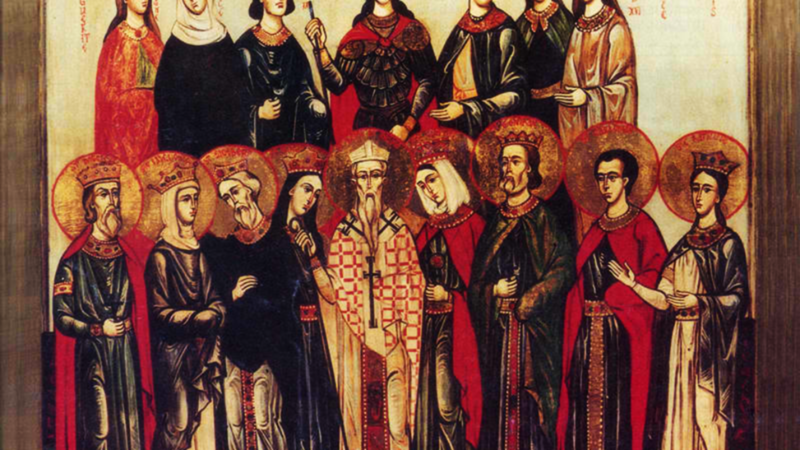 FELIX, LUCIOLUS, FORTUNATUS, MARCIA, and COMPANIONS, (Date Unknown), members of a group of forty martyrs in North Africa. The names of the rest of the group are no longer known. FOILA (FAILE, FOILENNA, FALLENA), (Sixth Century), believed to have been the sister of St. Colgan (20th February), together they are the patrons of the parishes of Kil-Faile (Kileely) and Kil-Colgan, in Co. Galway. Kil-faile has been a noted place of pilgrimage. At one point, there was a written record of her life called The Acts of St. Foila , however, it is no longer extant. LAMALISSE, a Scottish hermit for whom Lamlash on the Isle of Arran is named. No further information on St. Lamalisse is extant. SACER (MO-SACRA), (Seventh Century), an Irish Abbot-founder of the monastery of Saggard (Teach Sacra - 'house of Sacra' in Irish Gaelic) near Dublin in Ireland. TITIAN, a Bishop of Brescia, of Germanic birth. St. Titian reposed circa 536. WINWALOE, born in Brittany to English exiles, St. Winwaloe was related to SS. Cadfan (1st November), Selyf (25th June), and Cybi (8th November). He became a disciple of St. Budoc (9th December) on the Île Lavret. He went on to found the monastery at Landévennec, which he governed until his repose in the first quarter of the sixth century. There are several churches in Cornwall dedicated to him, indicating a connexion between him and that area. Unfortunately, there is no reliable Life known to us, and it is difficult to attempt to construct one from various traditions, many of which are contradictory. It is even possible that there may have been more than one saint of his name.